Maintain space. Make sure to leave adequate space between your vehicle and the bicyclist. Don’t tailgate or pass too closely. This is especially important since the bicyclist may not hear you coming; it is often louder for the person on a bicycle than it is for a person inside a vehicle. Stay alert. Aside from a helmet, bicyclists have little protection while riding, and an accident with a bicyclist can be fatal. Keep your attention on the road, and reduce distracted driving as much as possible. Eating, talking on the phone, or driving while you’re drowsy can all impact your response time. It is also important to be aware of your blind spots. Pay special attention at intersections, especially when turning right. Patience is key at intersections. Right turns can be especially hazardous for bicyclists. Remember to look over your right shoulder before turning to make sure your path is clear. 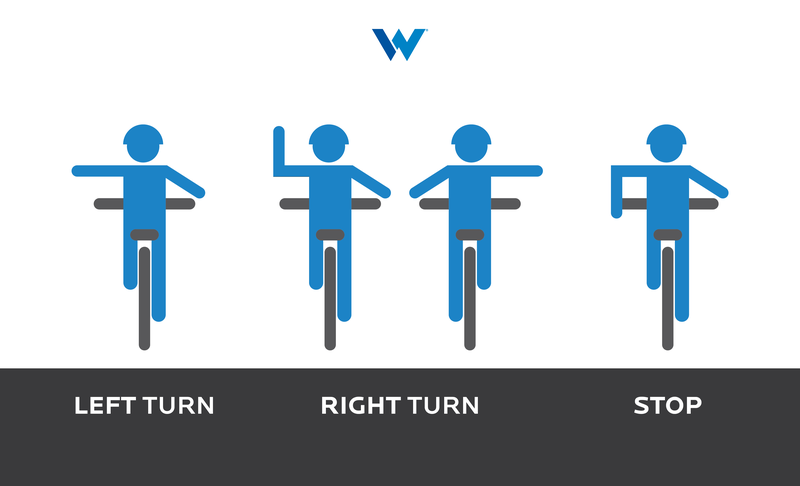 Intersections can also be tricky if you’re unfamiliar with bicyclist hand signals. Bicyclist hand signals (noted in the image above) can help you anticipate a bicyclist’s next move. Slow down. It’s a good idea to reduce your speed near bicyclists, even if you’re already going the speed limit. Look behind you before opening doors. If you park your vehicle on the street, remember to look behind you before opening your car door. Opening your door unexpectedly can surprise a bicyclist and cause them to either run into your door (bicyclists call this being “doored”) or swerve into oncoming traffic.